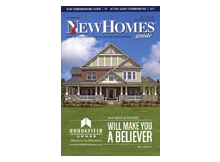 New Homes Guide – Washington D.C.
New Homes Guide, in print and on the web, is the Mid-Atlantic Region’s only complete guide to every new home community (including Single Family Homes, Townhomes, and Condominiums). We have been helping new home shoppers find their dream homes for over three decades. 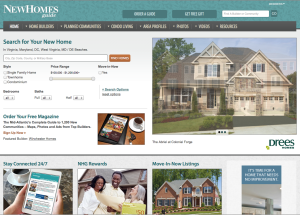 Our award-winning website, NewHomesGuide.com, is the area’s highest ranked new home website – in terms of both usage (more new home buyers use it), and ease of use. Visitors can also register for free to be become NewHomesGuide site members, in order to receive a multitude of benefits. We invite you to create an account and learn more. To receive a free copy of our latest issue of New Homes Guide magazine, click on “Get the Guide” and complete the order form. You’ll find that it is an excellent companion to NewHomesGuide.com, and travels very conveniently with you when you tour new home communities. New home community listings found in the New Homes Guide magazine are offered free of charge to builders and are updated with their assistance. All prices and finance claims appearing in this magazine are subject to change without prior notice. Copyright © 2003-2013 by Greater Washington Publishing LLC. All editorial matter is fully protected and must not be reproduced in any manner without written permission. If you are looking for new condominiums in Washington DC, Northern Virginia, Maryland, parts of West Virginia, Southern Pennsylvania and the Eastern Shore, please visit NewCondominiumGuide.com. New Homes Guide is a publication of Greater Washington Publishing LLC. Get your free magazine here!